Il trovatore: Cecily, how could you have ever doubted that I had a brother? The old canard is that all you need for Trovatore is the four best singers in the world. That’s stupid on a number of levels, one of which was illustrated in this Met revival, which is super excellent despite being a rep night with only one known name. It was the best of what you can expect from a non-Event performance: an old favorite (Dolora Zajick’s Azucena) with an exciting newcomer (Guanqun Yu as Leonora) and a few more workman-like performances that nonetheless had much to enjoy. Even Daniele Callegari’s conducting was pretty good! However, this production is so bland that you almost wish David McVicar had made a frame narrative about the singers we are seeing this evening. Nah, not really. Verdi, Il trovatore. Met Opera, 10/17/2012. Production by David McVicar (revival), conducted by Daniele Callegari with Guanqun Yu (Leonora), Dolora Zajick (Azucena), Gwyn Hughes Jones (Manrico), Angel Òdena (Conte di Luna), Morris Robinson (Ferrando). 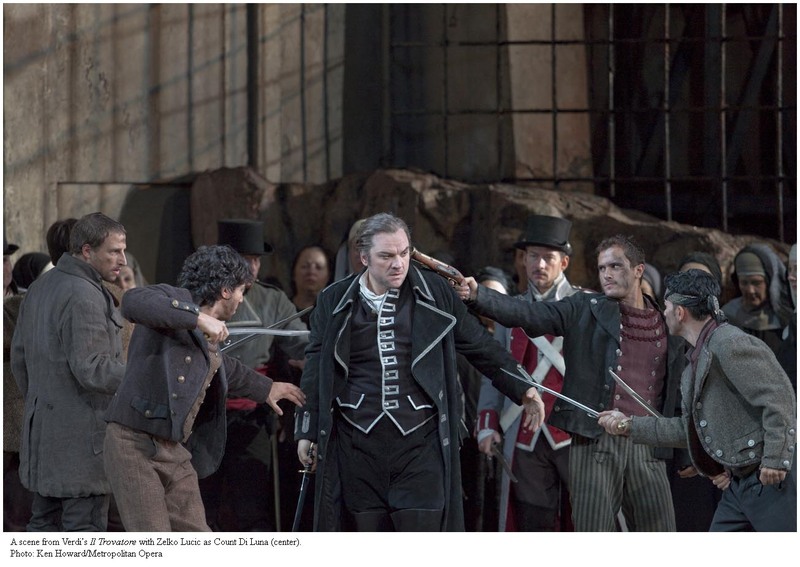 Il trovatore’s lusty embrace of melodrama provided Verdi plenty of chances to write exciting music for so-called “extreme situations.” But today, when that opera is considered part of our cultural pantheon and operatic characters are conventionally analyzed in psychological terms, no one is sure as to how seriously we should take it. 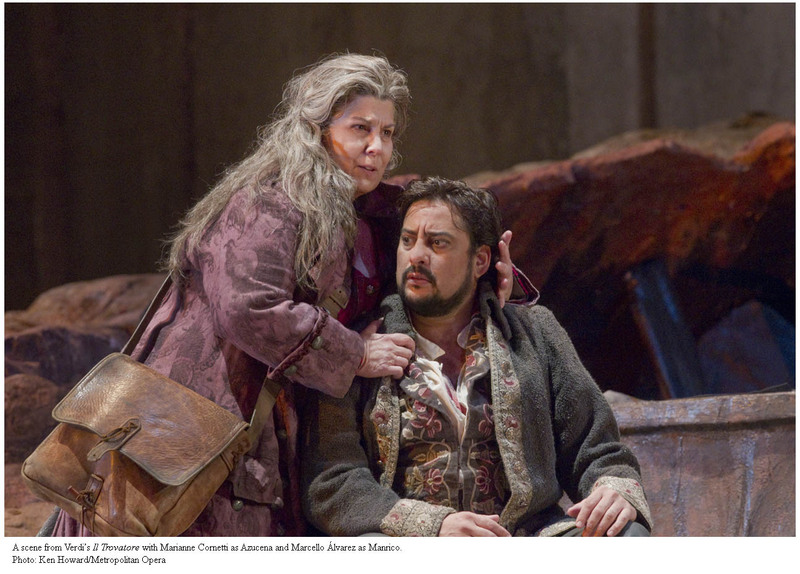 Contemporary opera-goers tend to be a rather literal-minded bunch who want to follow the plot and identify with the characters’ plights, and with Trovatore they can find their credibility awkwardly tested. Even after you untangle the complicated back story, you are left with plot devices like baby-swapping, gypsy curses, infants thrown in fires, and a very sketchily drawn political situation, plus a few points where the motivations of the characters are, shall we say, obscure. David McVicar’s Met production takes the friendliest path out of this mess by telling the story in as straightforward and easy to follow a way as possible, making the characters lively and sympathetic when applicable, and keeping the action moving with his turntable stage. The early nineteenth-century costumes and looming walls of set are fine and not over the top without doing much of anything. What distinguished the first run was McVicar’s personal touch with the singers, who gave fairly nuanced interpretations based on their personal standards. It doesn’t look like he directed this revival (some of the anvil-hitting guys were wearing shirts–a dead giveaway), and the blocking is more schematic this time around. When Ferrando goes up the stairs, it looks like he’s doing it so he’ll sing out from above the chorus, not because he wants to go anywhere. It’s still an effective-enough staging that gets the job done without too many egregious clichés, but I would like to see something that has a stronger perspective and doesn’t seem to want to put the mellow in melodrama. For a red meat sort of opera this thing seems pretty mild-mannered in its earnest (and, granted, mostly successful) attempts to avoid unintentional comedy. 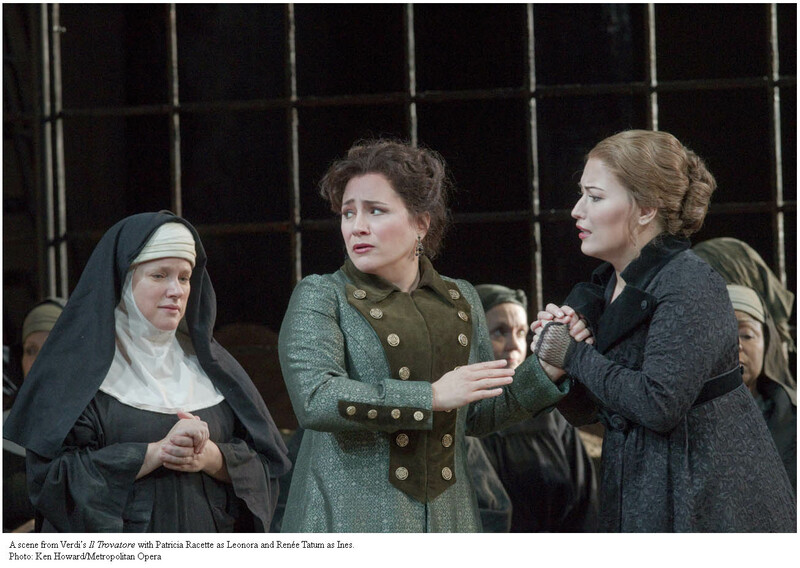 Everyone’s measured reactions give the impression of logic and rationality, but is Trovatore happening in a rational, reasonable sort of place? I don’t think so. McVicar’s concern seems to be ironing out a problem opera into something no one can really object to (except on grounds of boredom). For a more inspired director with a more adventurous audience, the opera’s unusual aspects might present not a liability but an opportunity to do something interesting and distinctive. * Oh well. 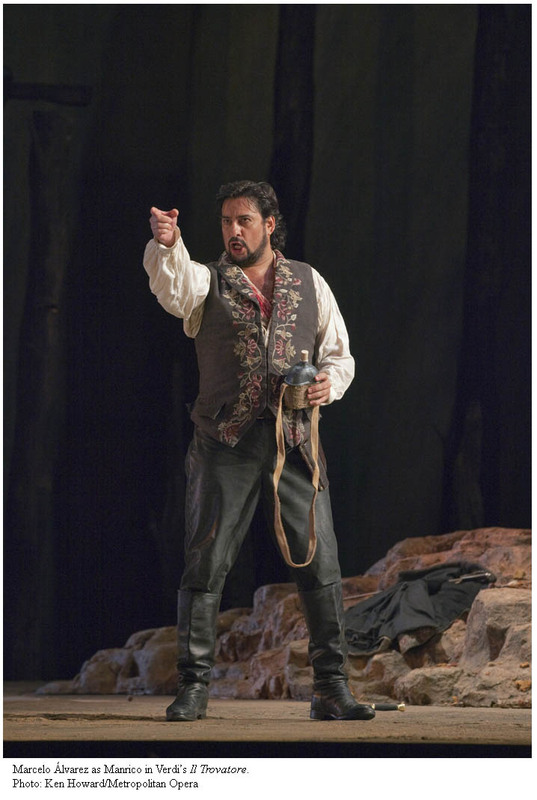 Making his house debut this performance was baritone Angel Òdena as the Conte di Luna. His instrument is formidable, a gravelly, imposing, somewhat dry baritone that has real Verdi quality. Unfortunately his sense of rhythm and pitch tended to be vague, particularly in the big aria, and his sense of character more mustache-twirling than anything else. Still, considering he was the cover and got virtually no rehearsals, an impressive effort. Also impressive if not entirely satisfying was Gwyn Hughes Jones as Manrico. He is an honorable performer with a bright, ably used tenor, and sings with consistent taste and style. 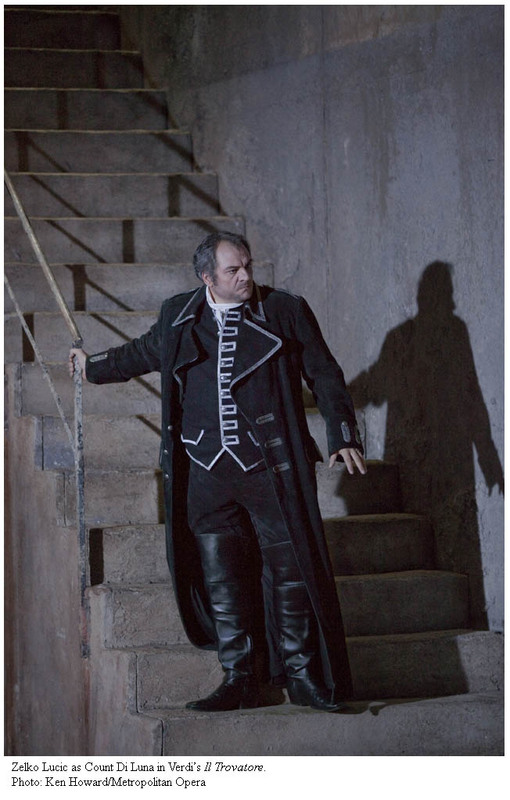 Unfortunately the voice is a little on the small side for this role at the Met, and lacks power at the top, where his narrow vibrato turns towards a bleat. While an OK actor he didn’t make an enormous impression, character-wise. Morris Robinson was a vocally smooth and sonorous if less than dramatically imposing Ferrando. I have left Dolora Zajick for last because her Azucena is a legendarily known quantity. She was announced as ill but sounded as mighty as usual (high notes were a little short). She showed some signs of remembering McVicar’s direction (she was in the premiere cast of this production), but her main appeal remains her ability to sing louder and more excitingly than anyone else. She does that, and inarguably knows her way around this music. It’s a classic portrayal, and still thrilling. Conductor Daniele Callegari’s goal seemed to be to go as fast as possible, but excitement isn’t amiss in this opera. Over than the speediness, it was competent and usually flexible when it needed to be. Sometimes Òdena didn’t seem entirely with him, but the orchestra was fine. If you need some satisfying operatic protein in your diet, consider this revival, which has two performances left this fall and will return in the spring with the same conductor and an entirely different cast. *For more interesting Trovatori I recommend considering Dmitri Tcherniakov’s dark Brussels effort (not yet on DVD but streamed on the internet this summer, so hopefully coming). I am also curious as to what Olivier Py’s Munich production will bring next summer, considering his Lulu was extreme enough as to almost melt my eyeballs. Guanqun Yu sings “Tacea la notte,” then follow some photos of previous casts. I was happily impressed with the McVicar production when it was imported briefly to the San Francisco Opera a few years ago, complete with Dolora walking off with the show yet again. 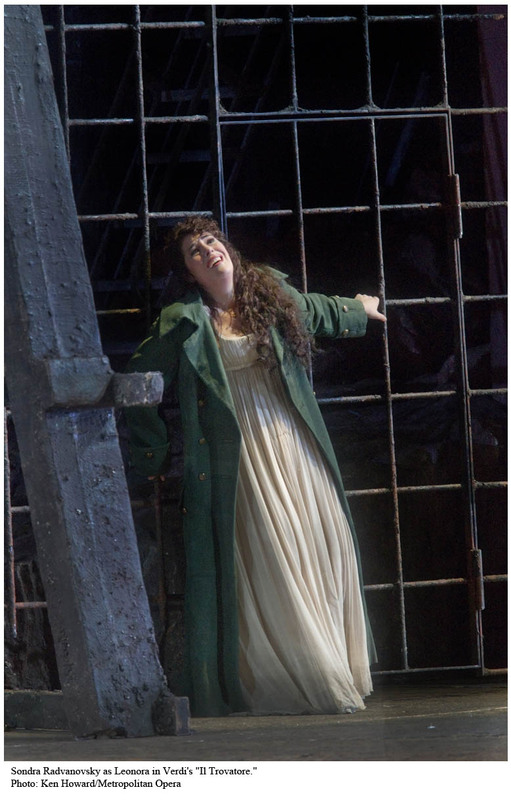 It was the first Trovatore production I'd ever seen which made some kind of geographical sense, not an easy task. The problem, as you state, is that at the Met you don't have the original director restaging the production, and the house assistant directors at that World Class venue are world-famous for being sausage factory, from-the-production-book routinières. That can kill a decent production fast. That strikes me as a little harsh, Michael. The staff directors also have far less time to rehearse and often are obliged to follow the notes to the letter with singers who don't have terribly much interest in duplicating what they see as someone else's interpretation, and without the conversations that made everyone understand why the choices were made the way they were. I mean, there are problems inherent in the revival process, independent of how good or bad the director is.